Hi, and welcome to our little adventure. Let us introduce ourselves. We're Scott and Laura Kruglewicz. 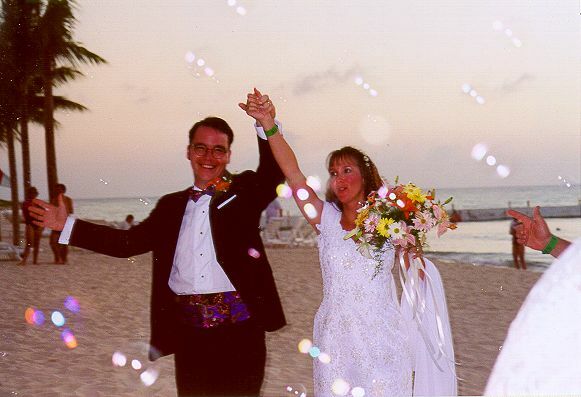 This is a snapshot of us getting married on the beach at sunset in Cozumel last October (yes, Im wearing tuxedo "shorts"). We include this photo because we think that our wedding weekend in Mexico, with 80 of our friends and family, does well to explain by example a little about who we are. As a rule we enjoy doing things that:1) are a little out of the ordinary, 2) we can share with family and friends (old and new), and 3) encourage us to live life as fully as possible. Laura and I were both ready for something that let us do all three, and thus, Worldwide Wanderings was born. Early this year, we decided to take a little risk and leave our jobs (Laura was in Customer Service for Adventure Travel, and I had spent the last 2 years as a Director of Sales and Marketing for GE Capital IT Solutions), and our home (Atlanta, Georgia), to spend the next year traveling, quite literally, around the world. Honestly, I have had this little adventure on my list of "life goals" since before I started my own business over 9 years ago (I sold to GE). For a number of personal reasons, including thinking about starting a family (Im 32, and Lauras 34), the time to mark this one off our list has come. So, being blessed with at least adequate financial resources and more importantly, a thirst for adventure, new places, and interesting people, were going for it. As if circumnavigating the planet isn't crazy enough, were going to maintain this site, worldwidewanderings.com "real-time" with journal updates and photos of our adventures and experiences. In preparing for our trip, Laura did most of the planning and logistics. I was primarily responsible for getting the new business going (yes, advertising banner slots are still available), designing and creating the site, and putting together the technology were using to stay in touch. We hope this site encourages people like you who visit it to "just do it", whatever "it" may be. Its a big world, and our time on it is relatively short. Its a world big enough to hold untold new places to see, new things to do, and most importantly, new people to meet. Last Modified: August 11, 1999 Photographs and text � 1998 Scott and Laura Kruglewicz. All Rights Reserved.